Tell Me the Old, Old Story! As Adolph Hitler rose to power in the late 1920’s, he thought to take over the German church and dictate a national religion. It seemed a perfect plan till he hit a major roadblock: Christmas.! He could make cultural attempts to strip Christmas of its meaning by outlawing traditional observances in the public square, but he could not stop Christmas! 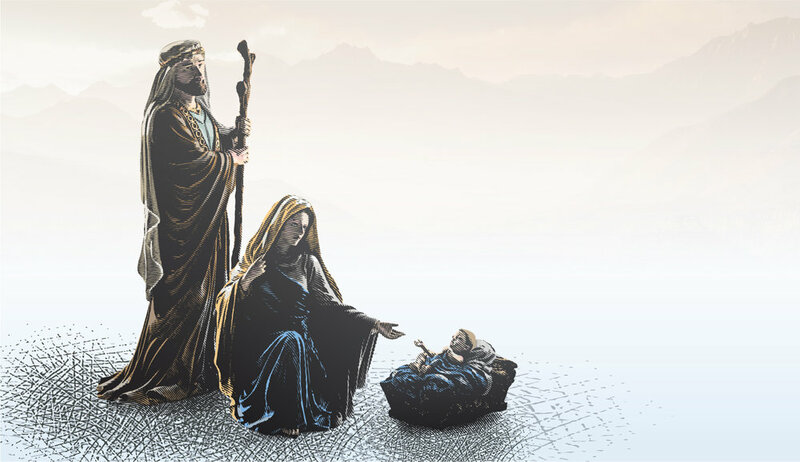 The German people had faithfully observed Christmas celebrations for centuries, and the march of tyranny stumbled when it came to the influence of one small Baby who grew to become the Man, Jesus Christ of Nazareth. Hitler’s scheme failed as so many others before him and after him for one simple reason: you can’t spell Christmas without Christ. I won’t spend a lot of time and effort demonizing the creeping secularists who want a holiday without the element of religion. But I do feel sorry for them, since the element of religion is the only reason we have the holiday. Christmas is a unique and opportune time of year because it is a Christian holiday that has also become a major secular holiday (arguably, our culture’s biggest). This results in two different celebrations, each observed by millions of people at the very same time. As the two coexist, we each feel the intrusion of the one upon the other, a situation which doesn’t promise to be resolved anytime soon. It’s like two parallel universes on a yearly collision course. But during the two weeks or so that these two worlds approach each other so closely, and seem almost in sync, people tend to be more open to receive a supernatural deposit. This gives us the opportunity to engage people with the message of the Gospel and the real meaning of Christmas. Yes, once again, we can tell the story! And this has been my approach for quite some time. As I sat on the platform a few years back listening to announcements for Christmas activities, suddenly, the Holy Spirit whispered in my heart: You need to tell the story. There’s power in simply telling the story! I made some quick notes, adjusting my focus. Since that time, I’ve made it my aim at Christmas not only to preach sermons, but to have a special night to tell the timeless story of Christ’s birth in reading, dramatization, and song. This year our annual Christmas Reading happens to fall on Christmas Eve. A meta-story is a story about a story. It encompasses and explains other little stories that come together to make the larger scale story into a whole. The power and fruitfulness of the Christmas story comes from the fact that it plays a crucial part in a much larger narrative of God’s His-tory of rescue and redemption. This is the meta-narrative of the Christian story. The Bible is not simply a book of religious instruction. It is God’s self-revelation; it gives us God’s meta-story of how, where, and why things fit into a larger whole. The Bible is the story of reality: How the world began, how it ends, and everything important that happens in between. Not “your truth” or “my truth,” but THE TRUTH, God’s truth. Children are experts at the question, Why? Why is the sky blue, Mommy? Why does the egg hatch, Daddy? As we get older, our Whys target the deeper heart of things. Why am I here? Why is anything here? How did things get into such a mess? How can we fix it? What is truly important? And at Christmas time, What Child is This? Christmas is all about the Person and work of Jesus Christ. God initiated His rescue plan for man who is horribly broken in a world gone terribly wrong, by sending us the God-man, Jesus. Bible prophecy foretold that the “seed of the woman” – a genuine human being like ourselves – must do battle with the snake (Genesis 3:14,15). It was essential that our Rescuer share our essential humanity in every way. Though conceived by a miracle, Jesus entered the world through labor and pain, just like you and me. All that we experience, all that we desire, all that we dream; all that discourages us, all that delights us, all that disappoints us; all our hungers and hopes and distresses – all these were experienced by Jesus. He is like us. He is one of us. But the companion truth is that Jesus said things that no mere man is able to say. He said, for example, that He existed before He was born; that He has power to forgive sin; that the honor due the Father is due also to Him; and that the final judgment falls to Him: it is His lot. He says that He is drink for the thirsty and bread for the hungry, so they will never thirst or hunger again. He says that those who trust in Him will live, even if they die. The Temple guards were sent to arrest Jesus and they returned empty-handed. “Why didn’t you bring him in? !” demanded the power brokers of the time. "We have never heard anyone speak like this!" was all they could say. “You are the Christ, the Son of the living God,” said their spokesman, Peter. “In the beginning was the Word, and the Word was with God, and the Word was God. He was in the beginning with God. All things were made through him, and without him was not anything made that was made. In him was life, and the life was the light of men. The light shines in the darkness, and the darkness has not overcome it” (John 1:1-5). This, beloved, is what sets Christianity apart from all other world religions. This was Jesus, our Emmanuel, God with us. I encourage you this Christmas season to engage in a very edifying and mind-expanding exercise: the attempt to grasp a bit of what I like to call the dimensions of the Christmas story. A phrase frequently found in the Bible is, “the ends of the earth.” Whether in reference to people’s needs, their worship, or God’s dominion, His salvation carries this breadth. “He has remembered his love and his faithfulness to the house of Israel; all the ends of the earth have seen the salvation of our God” (Psalm 98:3). This is why it’s perfectly fitting to hear this song before the throne of God: "Worthy are you to take the scroll and to open its seals, for you were slain, and by your blood you ransomed people for God from every tribe and language and people and nation.” Oh, there’s such a breadth here! Christmas did not initiate some exclusionary “holy club,” but the Good News that reaches out to all men everywhere! I love the old worship song by Andrae Crouch that says of Jesus’ Blood that It reaches to the highest mountain; and it flows to the lowest valley. There’s an incredible length or reach here. If we want to examine this length in a timeline, we can go back to eternity past (1 Peter 1:20) when “God chose Him as your ransom long before the world began.” Then, go and attempt to measure the immeasurable, as it says in Isaiah 9:7: “Of the increase of His government and of peace there will be no end, on the throne of David and over his kingdom, to establish it and to uphold it with justice and with righteousness from this time forth and forevermore.” Can you see? There’s a length here that goes on and on and on. Now you’re getting to the heart of Christ’s amazing condescension, as He lowered Himself, down and down. Gregory Koukl again summed up Christ’s great condescension in Philippians 2:5-8: “The Story is saying this: Even though the Son never ceased being God, still he surrendered his divine rights. He laid them aside. He let them go. Like a king who – out of love – removed his crown, set aside his scepter, took off his royal robes, donned the garb of a common beggar, and lived among the poorest of his subjects. Never ceasing to be king, he got low – so low he willingly died the death of a despised criminal–all to serve his own.” Here is the answer to the questions posed by the Christmas carol, What Child Is This? It powerfully reminds us of the true meaning of Christmas. On June 5, 1978, a seven-year old boy named Martin Turgeon slipped off a wharf and fell into the Prairie River in Canada. At least a dozen adults saw him struggle for a few moments before he sank and drowned. Why didn’t anyone dive in to save him? As it turns out, just upstream, a plant used to dump raw sewage into the river. The water was dirty – dangerous to your health. So, nobody jumped in to save Martin Turgeon. I am so glad that our God did not take this attitude! Our radical, righteous and amazing God personally jumped into the putrid waters: "Behold, the virgin shall conceive and bear a son, and they shall call his name Immanuel - God with us." It’s crazy, over-the-top love! The God of the Bible - the God of Christmas - is much better than we could ever imagine! It is this “with us” God that makes Christmas so astonishing! The living God was funneled into the womb of a virgin named Mary, in order to plunge into the mess and shame of our lives to bring us forgiveness of sins, and the promise of a new and rescued (saved) life! It’s only as we take in these remarkable and extravagant dimensions that we can “live full lives, full in the fullness of God.” This is not a God throwing His weight around, pushing us against our will. It is, rather, the work of God’s Holy Spirit, like the wind, moving in and through our hearts. One of the longest-standing and successful TV shows is 60 Minutes. When creator-producer Don Hewett was asked the secret of its success with viewers, his answer was both simple and direct: “Tell them a story!” That’s what we all get to do at Christmas time. It was probably my junior year in high school when I sat down with my neighbor’s twin boys to watch The Greatest Story Ever Told. I wasn’t a Christian then. I was not at all well versed in Bible teaching. But I remember to this day how deeply moved I was by the images on the TV screen that depicted the life of Christ. It impacted something deep within me, and, well… here I am. Fifty years later, and I’m still enthralled with The Greatest Story Ever Told. The story of God’s love. The best stories are like that. We simply can’t get enough of them. Older PostI’VE GOT A WORD FOR YOU!